With the world united on the brilliance of Ducati’s Multistrada 1200 S-models, the arrival of the base model Multistrada slipped under the radar. Whereas the S-models are topped off with electronically adjusted Ohlins suspension and carbon parts on the S-sport, panniers on S-Touring, the base model has manually adjustable Marzocchi forks and Sachs rear shock. ABS is optional. The detuned sports 1198 V-twin motor is reason enough in our book to buy one. As for Ducati’s revolutionary ‘riding mode’ system seen on the S-models, the base model still gets adjustable power delivery and traction control at the flick of a switch between ‘Sport’, ‘Touring’, ‘Urban’ and ‘Enduro’ modes. No electronically adjustable Ohlins here, but what you do get is a meaty set of 50mm fully adjustable Marzocchi forks and Sachs rear shock. For everyday use the forks are good enough for the majority of UK roads. Any adjustment to be made would be purely for the rider’s style of riding and luggage/pillion duties. The same can be said for the rear shock. 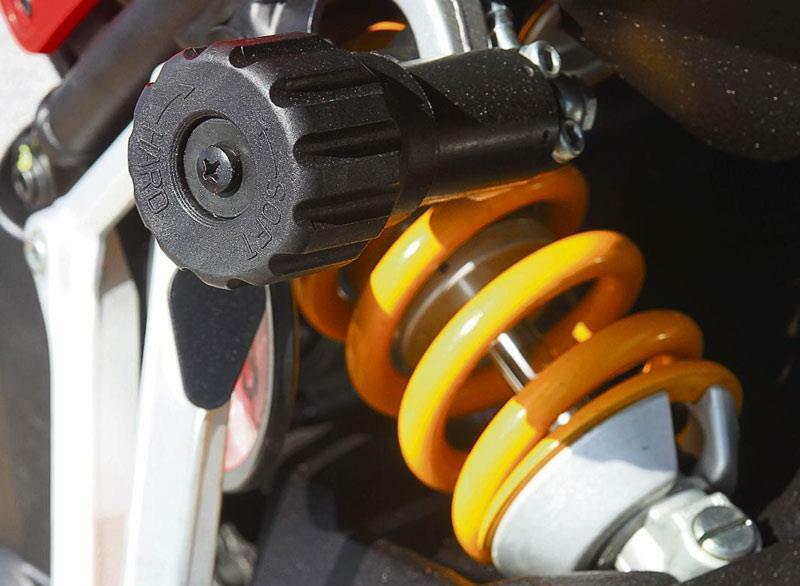 Ok, so the suspension isn’t as refined as the Ohlins set up, or as easy and as quick to adjust but for the majority of owners it is perfectly acceptable. 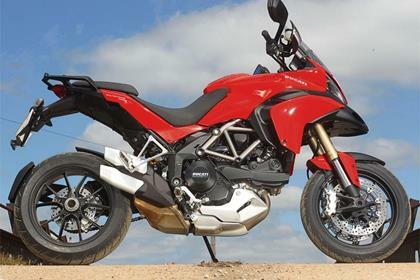 The Ducati Multistrada 1200’s Testastretta 11º motor is based on the 1198 V-twin but with reduced valve overlap for a softer delivery and has a host of mods including wet, slipper clutch, Mikuni ride-by-wire (to allow riding modes), and softer compression. Main benefit is smoother delivery, while reduced top end poke (peak power is 150bhp instead of the 1198S’s 180) is still more than enough to dust most ‘adventure bike’ rivals. 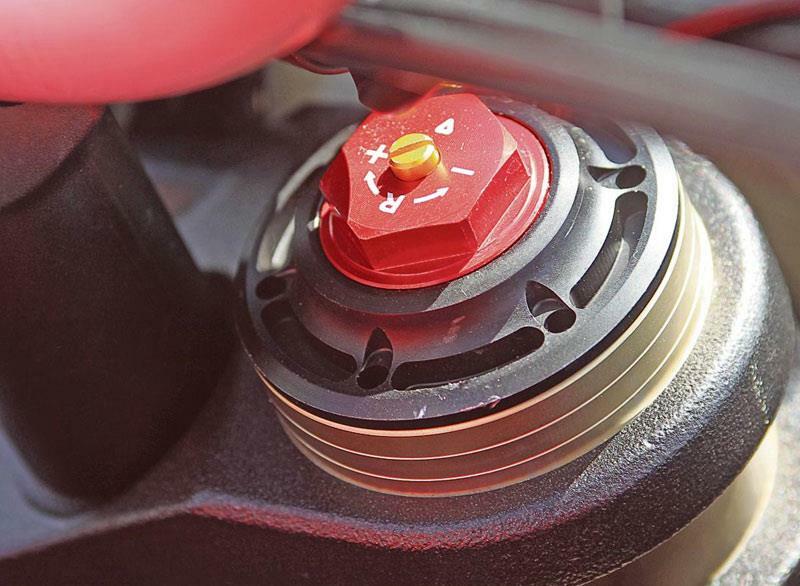 Doubling of valve service intervals to 15,000 miles is a further benefit. Ducati is getting better all the time and the Multistrada 1200 is proof. Service intervals are now up to and impressive 15,000 miles and generally it’s well built. 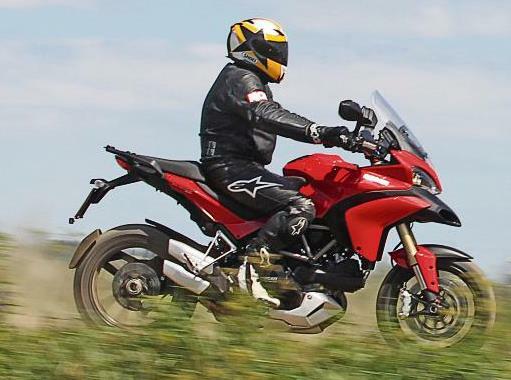 Full marks here because the base model performs with the same level of versatility as the Multistrada S-model and gives the same grin factor (massive). Find a Ducati Multistrada 1200 for sale. Even though this is the base model it still has adjustable traction control, slipper clutch, adjustable screen, high/low seat options (touring screen became standard in 2005), single-sided swing-arm, riding modes and a fully digitised LCD display console. The subframe retains the fixing points for the S-Touring’s panniers, which can be bought separately. Likewise a centrestand. ABS is optional. Ducati Multistrada 1200S Sport: Electronically adjustable Ohlins suspension. Carbon fibre cam belt covers, air intakes and hugger. £14,295. 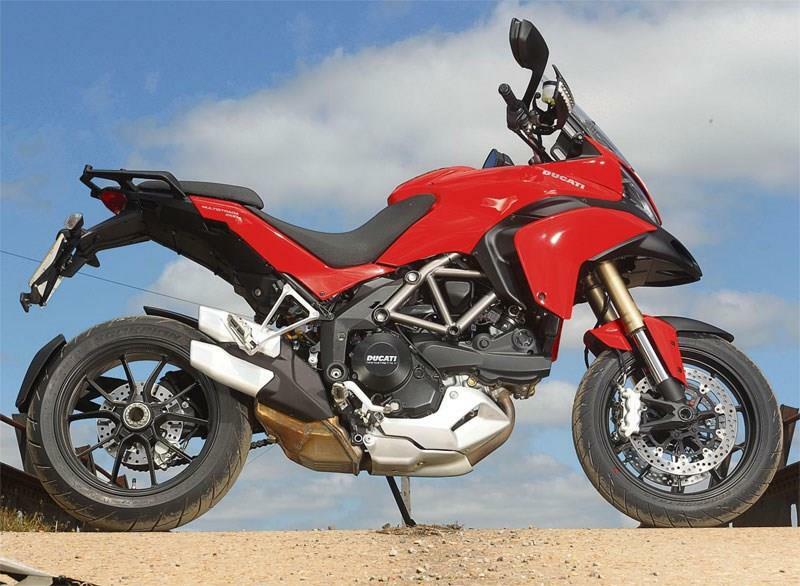 6 owners have reviewed their DUCATI MULTISTRADA 1200 (2010-on) and rated it in a number of areas. Read what they have to say and what they like and dislike about the bike below. Minor corrosion on hub of rear wheel and a couple of not integrity related bolts. Common fault of moisture occurring inside the dash that leads to colour bleed from the warning lamps. Some replaced under warranty but issue reoccurs. Bike is supremely comfortable to ride. I have a Termi end can, touring screen electric filler cap and comfort seat all factory options. Also purchased the semi active suspension SCU from Ohlins. Would have been 5 but rear brake is next to useless. Have corresponded with Ducati concerning this issue which resulted in a dealer fix which was only moderately effective. Throttle control at low revs is a tough act to master. Pulling away from low revs in any gear higher than 2nd can be far from smooth. When released equipment was second to none. Bought from new, dealership no longer franchised registered by bike as a 1200s sport with an incorrect frame number! Got bike 2 weeks ago - very tight engine when new but after just 500 miles it has become very much smoother on tickover and at riding speed. I've had a few GS's - they were great also but carry unecessary weight for mainstream use - they had more rubust luggage kit though. Thats where the GS advantage stops - The Multi is very much more agile - surprisingly easy on fuel - and biggest surprise to me ... in two up touring mode the suspension system definitely out performs the GS suspension comfort - I could hardly believe what I experienced. Regards power - it really is awesome - makes the boxer seem somewhat retro in performance. I still admire the boxer engine format. Handling in corners - first new bike I've scratched the pegs on after just 200 miles - it handles! Don't get me wrong I like BMW quality but they better wake up - Ducati bikes are no longer 2nd best on mechanics or electrical. I owned a 1098S for 3 years - never one problem with it - I hope the Multi exhibits the same reliabilty. Overall opinion - it is expensive but I believe it really sets the standard by which BMW for a change can compare themselves against in this particular model range. I admire the BMW GS but I have to say in all honesty Ducati really has set the cat amongst the pigeons with this bike. Sorry BMW. I've been riding for the last 26 years and I must admit, Ducati got it right... at least for the target market I fall in. This is truly a beautiful bike to begin with; the attention to detail really leaves you speechless, especially when another trademark stands next to it. I come from a super sport background and I found the Multistrada S to fit my needs perfectly. I ride mostly in Sport mode (150hp at hand is more than I used to have on my 1987 1100 GSXR or 1988 FZR or 2003 750 GSXR etc. ), but I sit so comfortably and if I take my girlfriend along, I still enjoy the ride with no extra aching wrists and back... I find it so easy and amazing to press the button and have the suspension automatically adjust to riding mode and extra passenger, luggage etc... and it also adjusts ABS and Ducati Traction Control “DCT” to every riding mode or to my own programming if I want to… truly amazing… The key argument I guess to this bike is: It is not the very best at each thing it tries to do (sports, urban, enduro, touring mode, but it sure comes close, so you don't feel like you are sacrificing in any one category so much that it defeats the purpose of owning the Multistrada, in the contrary it truly makes you feel you have the best of all... Which brings you back to the famous "Value" question: I have no doubt the Multistrada S is worth every penny I spent on it. The calculation is easy: to get the same amount of bike, you'll have to buy 2 or 3 bikes which will all be poorly finished in comparison and if you try to get the best of each segment, you'll pay much more, and there will still be lots of arguments to throw on the table.... I have absolutely no complaints so far on the ride & handling segment, the bike works flawlessly and is very easy to steer and maneuver. The only down score I gave it is under Quality & Reliability as my horn stops working as soon as the bike heats up a bit... I was told by Ducati that the problem has been recognized and new horns are being shipped... under warranty naturally... The engine is what I think is the best engine you can have on the street. V power with all the low end grunt is amazing… just compare the power curve of the Ducati 1198 S and the 1200 Multistrada and you will quickly understand that you get lots more power down low that you can realistically use on the road, every day. Hi after having number of sports bikes the last of which was a Daytona 675, I purchased the Multistrada 1200 ABS about a month ago. I must emphasise how impressed I am by the bike as a whole, from its feel and presence on the road, stonking engine,ace handling and fabulous suspension. Until recently running a V Strom 650 in addition to my Daytona 675, I would not have considered running just one bike if it was not a sports bike. However the V Strom made me realise you can have fun on two wheels without hyper speeds, and with total comfort and practicality. Would have got the S if could afford extra and not have to wait until Oct/Nov, though in reality have never really fiddled wiyh the setup of any of my bikes anyway so no great loss. It's not perfect however as gearchange not always positive, coule false neutrals, including at standstill with green neutral light on and gear position indicator at N.It does surge a little also which is more annoying than problematic, and does not really detract too much from spoiling ownership. Performance is phenomenal with loads of torque available, with superbike type performance not a problem but in total comfort. The front end does dive a lot when braking but may look at preload to stiffen it up a little.The four power modes are useful but think would only use enduro or urban if really wet or had unsure pillion, touring gives full 150 bhp with slightly softer delivery than the sports which gives instant go, and is the best mode when riding solo. Vastly reduced service costs were also a deciding factor in the selection of this bike, as my 749's service costs previously steered me away from Ducati. I have no idea how it fares off road as nearest thing ro off road I'd venture on is probably a gravel car park or similar. Thought seat height may be an issue as I'm a short arse, but the balance of bike makes you feel confident even at slow speeds / u turns. Only gripe really is really poor rear brake feel and performance, which would be nice for u turns to just steady bike. Economy averages 49 mpg and tank range gives approx 200 miles between fill ups, with comfort in between not a problem. Electronic dash is very comprehensive but why 40 mpg for first fuel consumption figure #?? Buffeting is not so much of a problem I have the easily adjustable screen set to the lowest position which does not cause any problems. Set to higher is fine unless taking a pillion when seems to be on oscillating motion behind my helmet.